When it comes to chimney repairs, A P Benson Roofing & Building should be your first and only call. 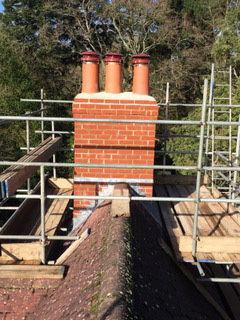 Continuously trading since 1980, we have been in the business of roof and chimney repairs for almost forty years, delivering a high-quality, professional service to customers in Guildford, Woking, Farnham, Chobham, Godalming, and beyond. Whether you have a working chimney or just the existing, blocked-off stack, it forms an important part of your roof system. Joined to the main body of the roof with sealant or lead flashing, any damage to the chimney can cause serious problems to the rest of the roof and the upper floors of your house, often in the form of leaks. These are some of the more common chimney repairs we come across. Chimney cowls stop things like water, debris, and small animals from getting into your chimney, so ensuring they have been properly installed, or repaired is an absolute must. Not only can this lead to a blockage that is hazardous for a working chimney, it can also cause damp and infestation. With a brick and mortar chimney, any cracks in the mortar need attending to straight away. Aside from the obvious concern of letting in unwanted water, if left to their own devices, these cracks will only get bigger, potentially causing large chunks of mortar, or even bricks to come away from the stack and damage the roof. Being exposed and upright from the roof, chimneys are particularly prone to storm damage. Heavy rain and winds can easily erode the outer surface of the chimney and strip away the lead work that connects it to the roof. 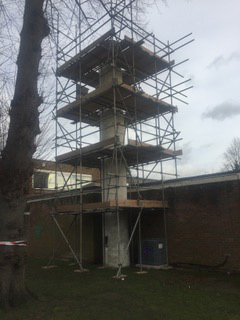 Based in our Guildford office, our team of chimney repair specialists cover most of Surrey, including the neighbouring towns of Woking, Chobham, Godalming and Farnham. 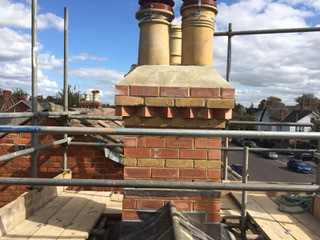 As well as having an unbroken trading history that covers almost forty years, our experienced team of chimney repair experts have been involved in the roofing business for over a hundred years between them. This level of experience cannot be matched anywhere in the local area, guaranteeing you the sort of professionalism and quality that only comes with over a century of expertise.